It's not quite the 'holodeck,' but it's close. "Don't look down!" my partner shouted from closely behind me, a tall, bald woman not unlike Sigourney Weaver's Ripley in Alien3, with solid birthing hips and a gruff voice that belied her exterior. We'd met only minutes before when 'she' was a physical he in the real world, an older, white-haired gentleman of 6'3" who happened to be wandering through Sundance's New Frontier exhibit just when I needed a second player to join me in Real Virtuality: Immersive Explorers. Together, we'd located magical crystals and traveled through time to soar through a futuristic city on a hovercraft, explore ruins by torchlight and overcome treacherous obstacles -- all within the darkened confines of the exhibit space. "It's basically a full body VR immersion system," says Sylvain Chagué, co-founder and technology director of Artanim, the Swiss motion capture research institute behind Real Virtuality. "It's a two-player experience. You are completely immersed in the virtual world. You can see your own body. You can see the other one. You can collaborate together ... pass objects from one to another and things like that." 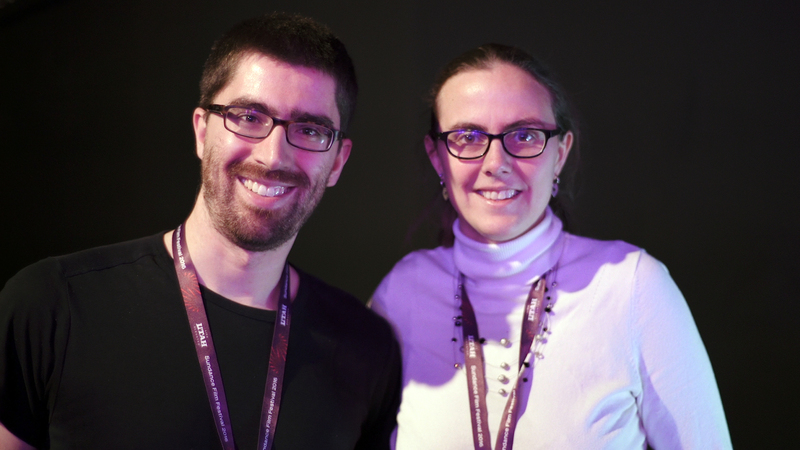 To pull off this convincing sense of virtual co-op play, Chagué and his partner Caecilia Charbonnier, Artanim's research director, eschewed the ready-made, room-scale tracking solution provided by HTC's Vive VR platform and opted instead to build a custom solution. Using 12 Vicon infrared cameras spaced throughout the room, the duo is able to track the small sensors dotted across the Oculus Rift headset, and on the player's hands and feet; as well as physical objects, like the torch and crystals. A lightweight, hard plastic backpack, also covered in sensors and worn by either player, carries a battery-powered computer that communicates wirelessly, so that you can freely roam in the space without fear of getting tangled in wires. "You basically have two things," says Chagué of Artanim's hybrid solution. "You have some data on the Oculus which is very fast data, but doesn't have position information and it drifts over time. But it's very low latency. And on the other side, you have the motion capture data which is very accurate, but has slightly more latency. So we combined the two kinds of data by fusing them in order to have both a low latency system and an accurate one." The result is a shapeshifting virtual playground that plays on your fear of heights (and spiders) and conforms to the space you and the other player are wandering in. It's an experience Chagué likens to being in the 'holodeck' from Star Trek and for good reason: Artanim has plans to commercialize Real Virtuality by installing it in theme parks across the world. "The plan is to have almost 100 or 200 square meters (approximately 1,000 or 2,000-plus square feet) so that you have really full spaces to play with," says Charbonnier. "Of course, the first interest will be for entertainment -- theme park attraction. We have a lot of interest for this. ... We just started a collaboration with different institutions, for instance the Futuroscope, which is one of the technological parks in France. But some other players in Russia and Qatar, as well."